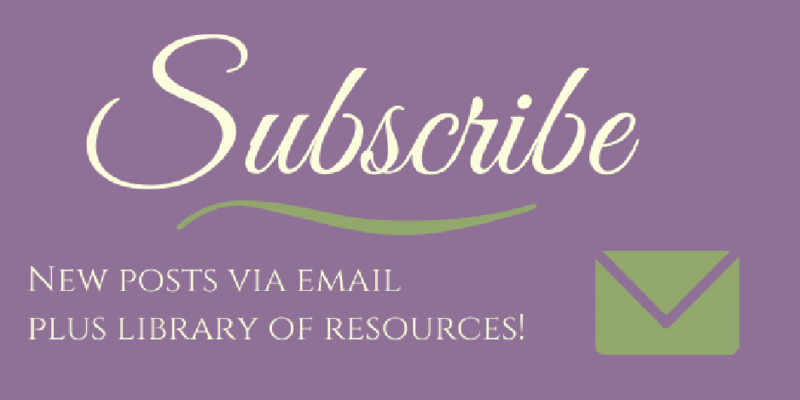 You are here: Home / Homeschool / Charlotte Mason / Review of Shiller Math – Great for Charlotte Mason Homeschoolers! It feels like the more gentle approach you take to learning, the less clear it is how to approach math. Especially once we reach kindergarten and first grade, there’s the nagging feeling that we’re missing a key component that our kids will need sooner rather than later. I’ve been one to tell people that math in the early years is largely learned from everyday life, which I do believe is true, but it doesn’t make nervous parents feel any better. We want a guide, we want boxes to check. We want to know that we’re doing the right thing, but we don’t want to stifle our child’s natural love of learning. The following is a review of Shiller Math, Kit 1 (Ages 4-8). I was given the kit for free to review and compensated for my time. As always, all opinions are my own. 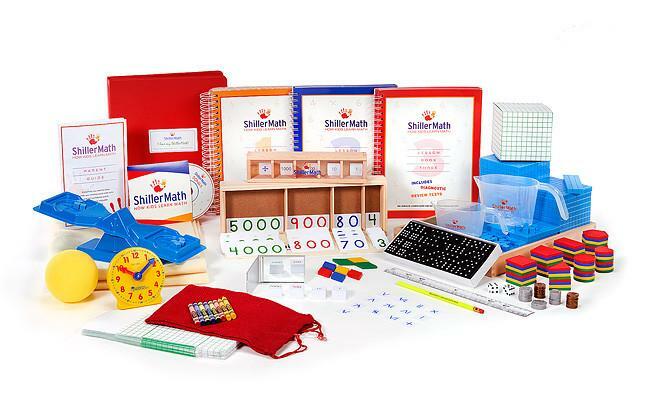 Shiller Math is a Montessori inspired math curriculum for ages 4-13, split into two kits: Kit 1 and Kit 2. 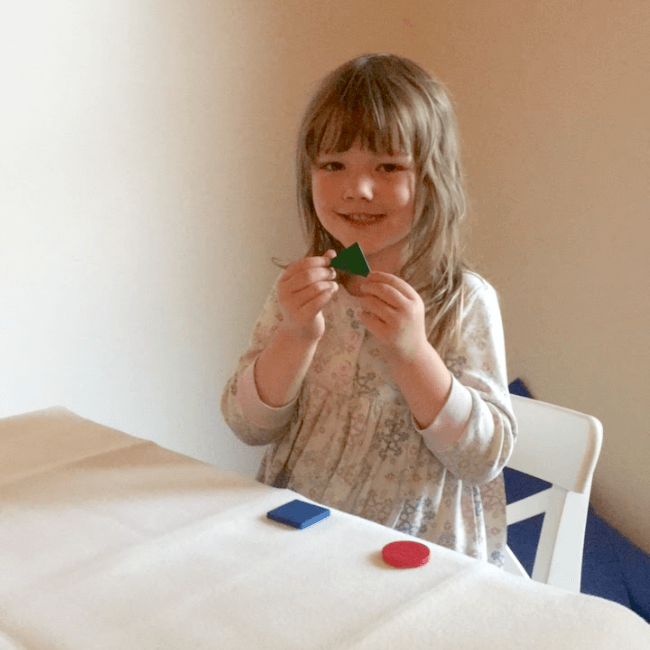 The Montessori approach uses hands-on activities through manipulatives and occasional worksheets. 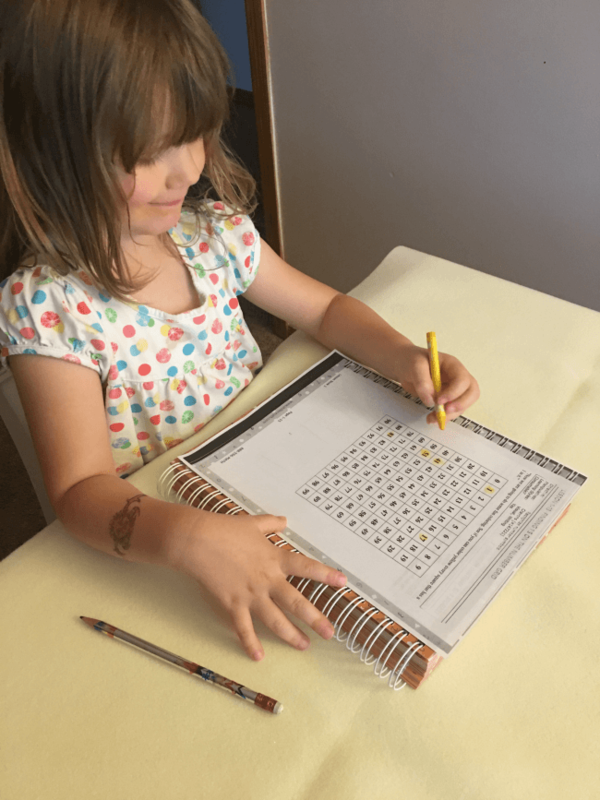 The worksheets are used for things like finding patterns, practicing writing numbers or roman numerals. Shiller Math uses a spiral method of learning, covering small pieces of information in each lesson, and coming back to review from time to time with ever increasing difficulty. Each lesson is short, some just a few minutes and other taking closer to 20 minutes to complete (from our experience thus far in Book 1 of 3 within Kit 1). Per the parent’s guide, you let your child decide whether they complete one lesson that day, or continue on to do more. There have been times we’ve gone through 3 lessons and I’ve had to tell my kids that I’m done with it for the day. We need to move on to other subjects as well! 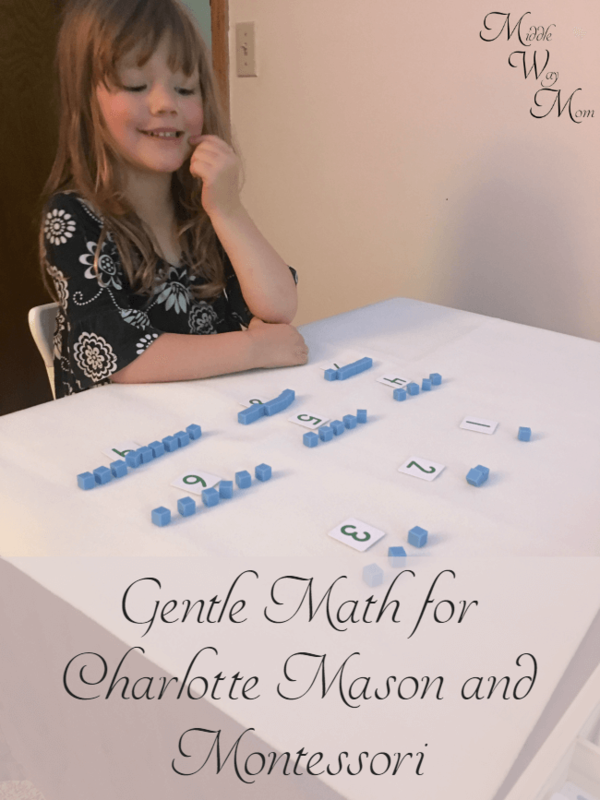 Since the lessons are short, bite-sized, and hands-on, it results in a really gentle way to teach math. Shiller Math is not a mastery model. The first time you approach a topic will not be the only time your child works through it. Shiller Math is also not a drill-and-kill approach. The focus is to build a foundation of math concepts and number sense to fully understand the equations they are being presented. Shiller Math is also not simply worksheets. There are many manipulatives to use to cement the concepts in various ways in a student’s mind. My kids LOVE Shiller Math. The tag line, “How kids learn” largely rings true, especially for my kids. When given the option to return back to our previous math curriculum, Aamina (my 1st grader) asked to keep going with Shiller. Since we are starting part-way through the curriculum, I also liked that there are a number of assessments throughout the book and to realize what lessons should be covered to fill in the gaps. It was easy to start with an assessment and get a list of lessons to cover, then jump to the next assessment and do the same, until we caught up to mostly all new information. One piece of advice: read through the parent/teacher guide! I’m guilty as anyone else at skipping over it initially. It’s super helpful, gives you some tips on how to work through the lessons, and it tells you how to access the answer book and printable consumable pages (if you don’t want to photocopy the teacher book when you come across a consumable page). I love that the lessons are short, keeping with our time limits in our Charlotte Mason homeschool. With another curriculum, it was hard to fit a whole lesson into one day, sometimes having to split it into two, which can feel a bit awkward to stop mid-way. To be perfectly honest, I had no intention to switch from our existing math curriculum because I was perfectly happy with it. I agreed to review Shiller for the sake of expanding my own knowledge of the offerings available in the homeschool market, but it really won over my kids! You can buy Shiller Math directly from their website. Each kit lasts 4-5 years, and doesn’t require any new purchases for more kids to use the kit. That looks really nice. I think my kids are pretty bored with our math program so I’m looking at their next level kit now. Thanks. Math is so hard sometimes! We want kids to love it, but sometimes that’s hard to do! Great! 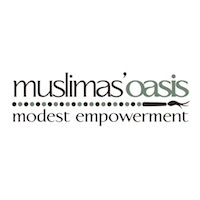 In sha Allah you have a good year. Let me know if you have any questions about this math curriculum. We have now started the second book and have started the first book with my 4 year old. 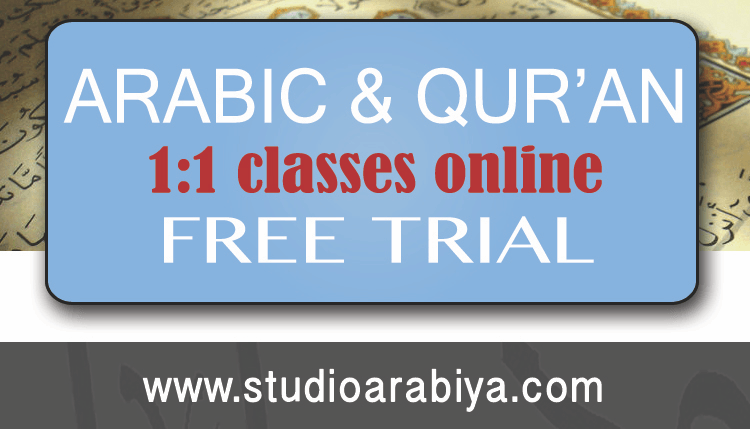 We have used this curriculum for two years now. My second grader is just finishing book 2 and my kindergartener is just starting book 2. One thing that I really appreciate is how Shiller Math slowly works in the foundations for more advanced math. There is a lot of laying down the rails for symbolic math, in particular with the use of Roman numerals and roman math. There were quite a few lessons where my kids asked to stay on they enjoyed so much. I’m so glad to hear feedback on it from those who have taken it through book 2! Yes, there is a lot of foundational work throughout the first two books, and it seems to go at a slower pace, but I think the kids have such a strong foundation that the kids’ number sense can help them solve more difficult things easier.